Quick and easy to make, with perfect delicious results every time and a cooking time of just 10 minutes! Makes a delightful side dish or can also be the base for a tasty meal, why not try the creamy vegetable pasta recipe? 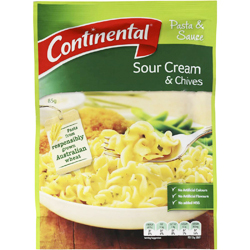 The twisty pasta and sour cream and chives plus other selected herbs make this a tasty, healthy and convenient meal or snack. Each packet contains 3 side dish servings.